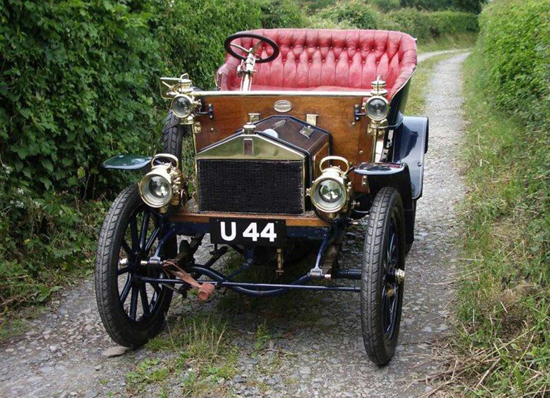 Name: "Rolls-Royce 10 hp Type A"
Features: Model "Rolls-Royce 10 hp Type A", 1904. Engine configuration: Straight 2. Engine location: Front, longitudinally mounted. Engine construction: cast-iron block and head. Engine size: 1,809 cc / 110.4 cu in. Engine bore/stroke: 95.3 mm (3.8 in) / 127.0 mm (5 in). Valvetrain: 2 valves / cylinder, OHV / Side-valve. Fuel feed: Royce Carburettor. Aspiration: Naturally aspirated. Engine power: 12 bhp / 9 KW @ 1,000 rpm. 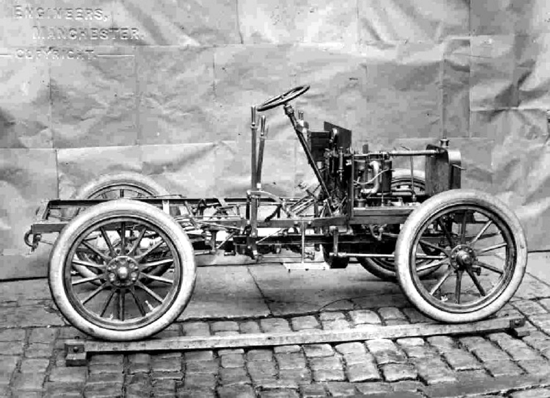 Chassis: Body on steel ladder frame. Suspension (fr/r): live axle, semi-elliptic leaf springs. Brakes: rear drum brakes. Gearbox: 3 speed manual. Drive: Rear wheel drive. Weight: 740 kilo / 1,631 lbs. Wheelbase: 1,905 mm (75.0 in). Length: 3,175 mm (125.0 in). Width: 1,400 mm (55.1 in). Power to weight: 0.02 bhp / kg. Top speed: 63 km/h (39 mph). 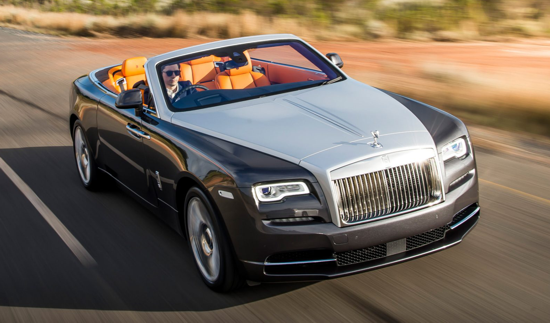 Interesting facts: Rolls-Royce grew from the electrical and mechanical business established by Henry Royce in 1884. 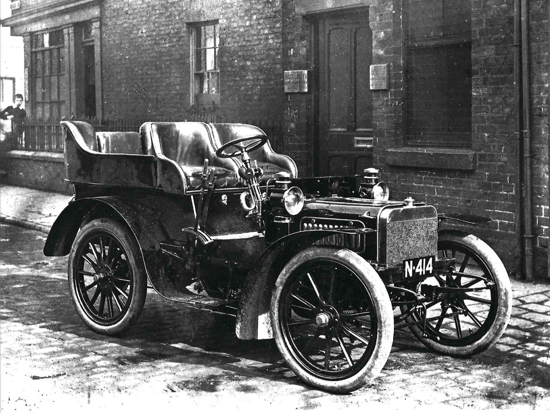 The first Royce motor car engine was tested on September 16, 1903 and on April 1, 1904 Royce drove his first 10 hp prototype out of the Cooke Street factory, Hulme, Manchester. On May 4 of that year he met Charles Rolls, whose company sold quality cars in London. 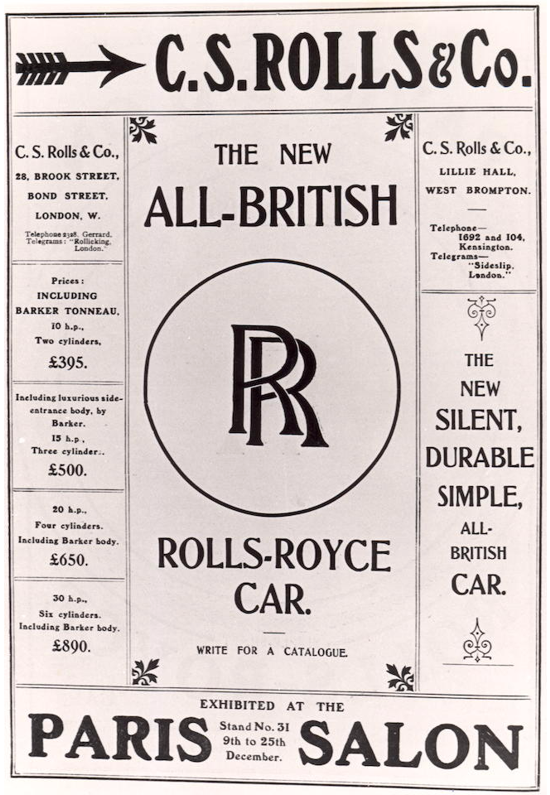 Agreement was reached that Royce Limited would manufacture a range of cars to be exclusively sold by CS Rolls & Co. Two more prototypes were built in 1904, for a total of three. 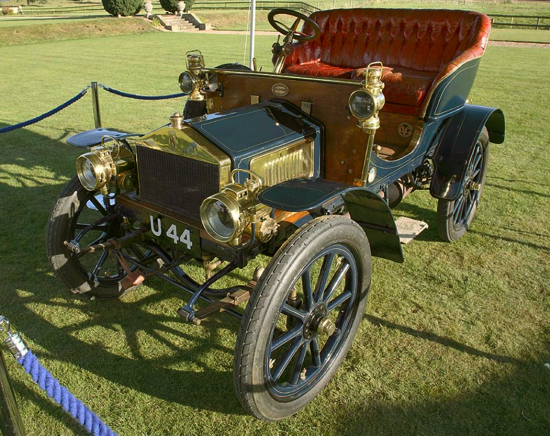 Rolls-Royce cars made their debut at the Paris Salon, December 9 to 25, 1904. The partnership was officially formed on December 23, 1904. 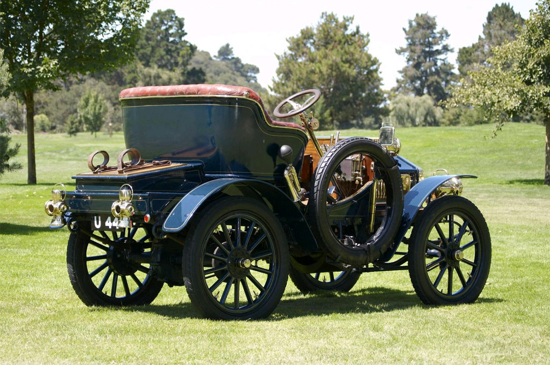 Initially, Charles Rolls and Henry Royce decided to make 20 "Rolls-Royce 10 hp Type A" models, but only 16 were finally constructed, the last in 1906. 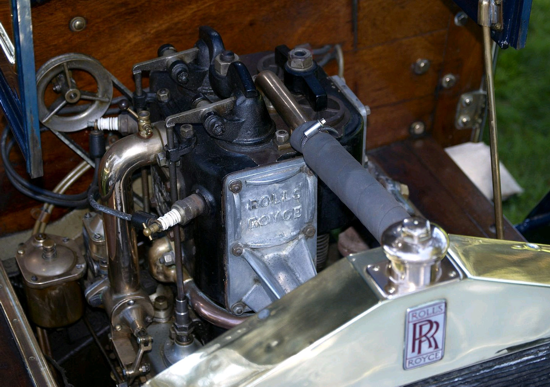 On March 15, 1906, Rolls and Royce formalised their partnership by creating Rolls-Royce Limited, with Royce appointed chief engineer. Quote (Sir Henry Royce): «Strive for perfection in everything we do. Take the best that exists and make it better. When it does not exist, design it. Accept nothing nearly right or good enough». Property: Rolls-Royce Ltd. - Rolls-Royce Motor Cars Ltd.
Royce 10 hp prototype (1904, Cooke Street factory). The first petrol engine was tested on September 16, 1903, and the first prototype was completed in the Cooke Street factory in March 1904. 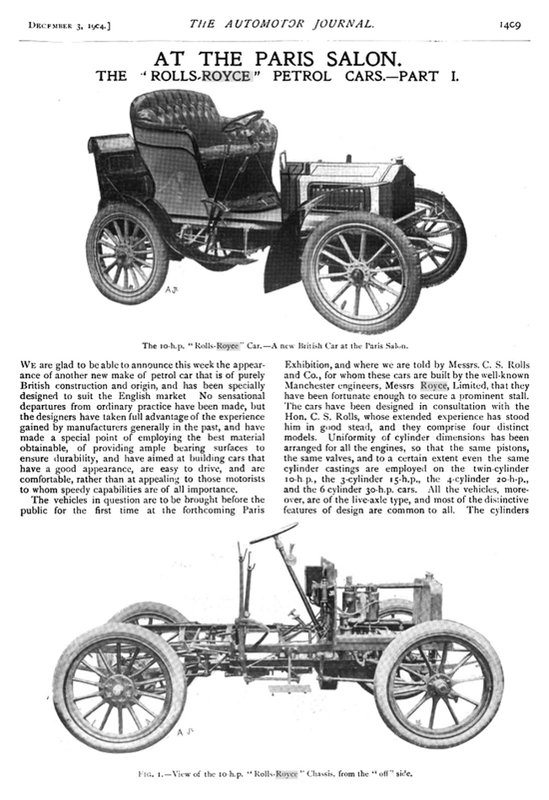 Two more similar prototypes were built in 1904, for a total of three. 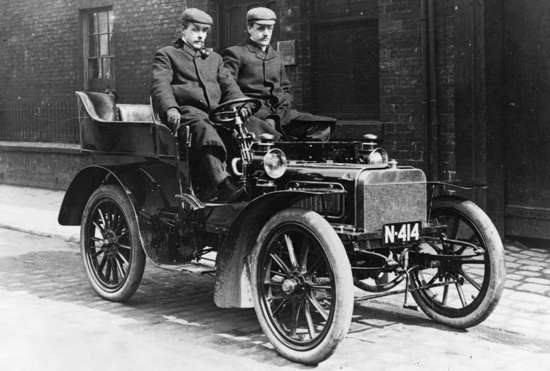 Rolls-Royce 10 hp Type A, Rolls-Royce's first ever produced car (November 1904). 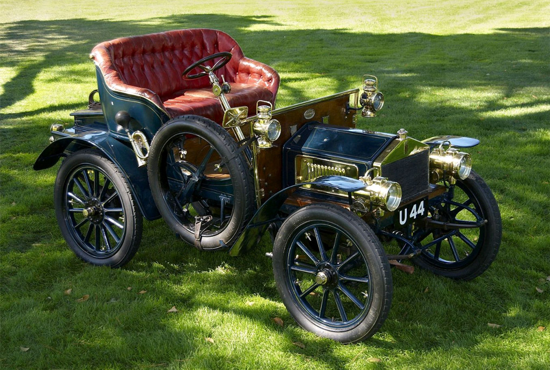 These pictures show the world’s oldest surviving Rolls-Royce 10 hp Type A, which came off test in November 1904 and was the third car to wear the Rolls-Royce radiator and the fourth car to carry the Rolls-Royce name. This car was selected for exhibition at the Paris Salon, December 9 to 25, 1904. 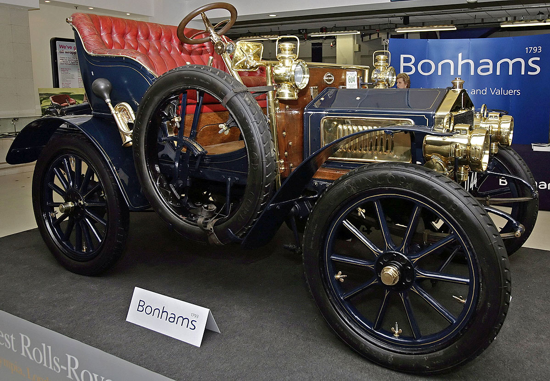 It was sold by Bonhams (London-based auction house founded in 1793) on December 3, 2007, for 3,521,500 GBP, breaking two world records: the highest price ever paid at auction for both a Rolls-Royce and a veteran car (pre-1905). 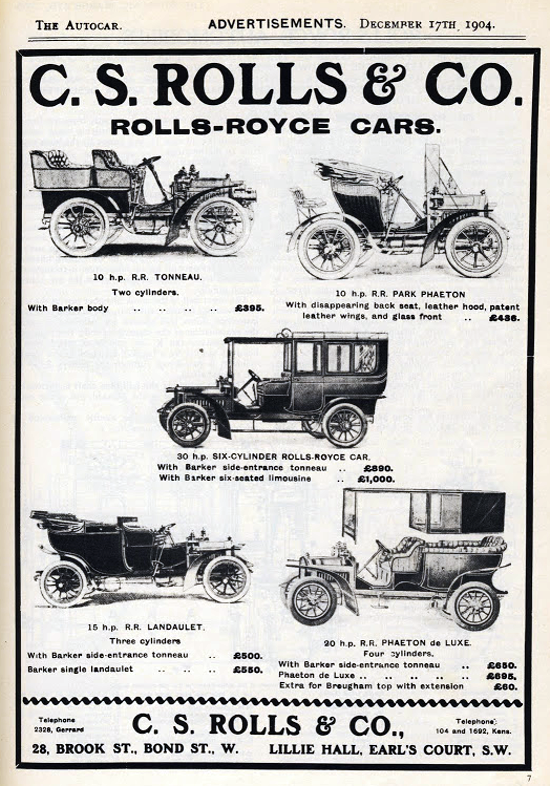 Rolls-Royce advertisement (The Autocar magazine, Dec. 17, 1904). 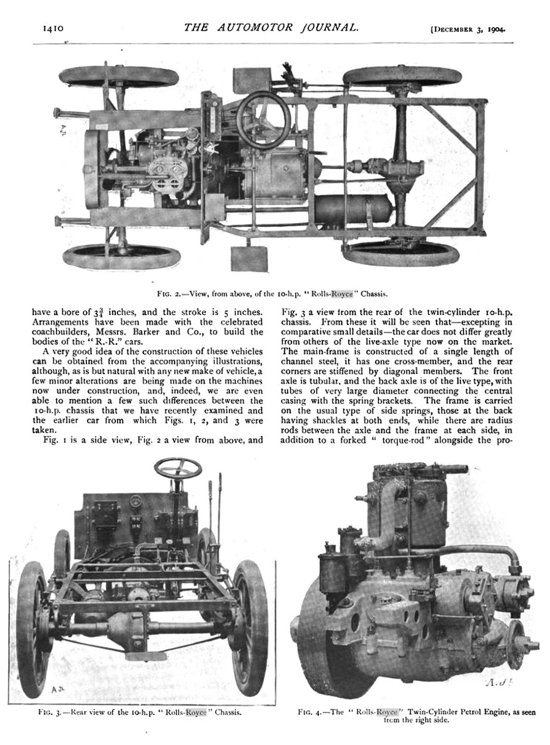 Top-left: 10 hp, tonneau, two cylinders, with Barker body, 395 GBP. Top-right: 10 hp, Park Phaeton, with disappearing back seat, leather hood, patent leather wings, and glass front, 436 GBP. 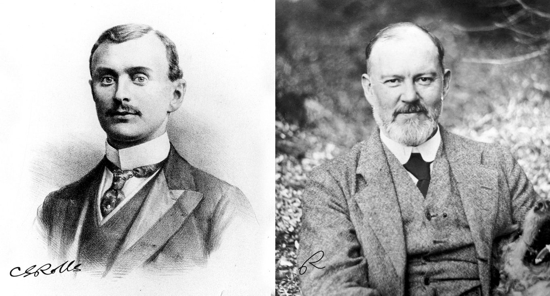 Rolls-Royce founders: Charles Stewart Rolls (Aug. 27, 1877 - July 12, 1910), motoring and aviation pioneer, and Sir Frederick Henry Royce (March 27, 1863 - April 22, 1933), engineer and car designer.